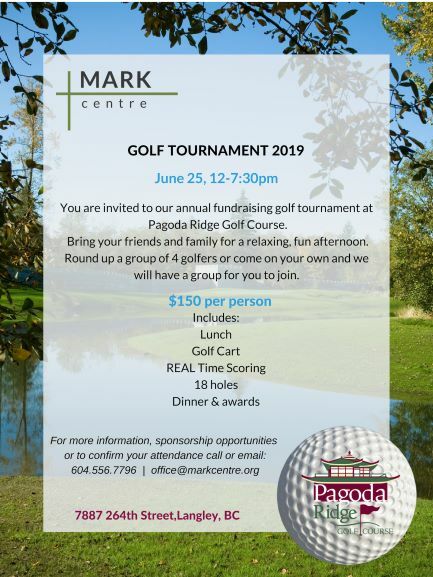 We are looking forward to our FUNDRAISING GOLF TOURNAMENT on Tuesday, June 25 from 12:00-7:30 PM. Please get this date into your calendars. We’d love to see you on the course! You can register by phoning our office. Thank you for considering being a major sponsor of this event. We are hoping to raise a significant portion of the annual costs of running the MARK Centre ministry. We will market all who sponsor the tournament to the community of golfers who attend and to friends of the MARK Centre. The return on your investment is really about how your gift will impact the running of this dynamic ministry. We are constantly amazed at how MARK Centre retreats and training sessions are touching people through listening to God in every detail of their lives. Please see below for the sponsorship opportunities remaining! Please contact our office at 604.556.7796 to register.